C8000 Battery Testing System – Aragon Instruments L.L.C. By all imagination,Cheap NFL Jerseys the Cadex C8000 may well be the most complete battery testing system available. Cadex C8000 stands in a class by itself at an affordable price. Digital technology has the advantage of delivering extended test range, ultimate stability and high power in a compact housing. Each of the four channels can be programmed to 10A charge and discharge. Power handling is 100W per channel on charge and 80W on discharge, or 400W on charge and 320W on discharge on all four channels. The Cadex C8000 is more than a programmable power supply and load bank; the instrument provides intelligence to assist in battery testing. Protected charge and discharge algorithms with redundant safety features identify a faulty battery and safely terminate the service if so needed. The system can be overridden for destructive tests. Four differential (floating) analog inputs enable voltage check of up to 5 cells; 4 direct and one by voltage extraction. The Cadex C8000 captures load signatures and applies the simulated load as discharge protocol to check battery runtime. Learn how your battery will respond to your device. Captures load signatures of up to 100A and digitizes the information for reply in the C8000. The LCU is optional. For higher load currents than 10A per channel, you can connect the C8000 to a designated external load bank, enabling loads of up to 2,400 watts and 48 volts. Only one channel supports the external load bank. The Dual Power Port Cable allows parallel connection of channels 1 and 2, or 3 and 4, to double the current handling from 10A to up to 20A. Only applies to discharge. The Cadex C8000 reads the register settings of SMBus batteries. 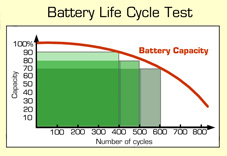 This verifies correct battery use and identifies anomalies. The Cadex C8000 allows testing batteries under GSM, CDMA or other discharge protocols. Programming is in 50μs intervals and the minimum setting is 500μs. The C8000 also offers dynamic stress tests to examine batteries under three different load conditions. This program assists in the selection of battery models and performs incoming inspection. The programs are fully automated, and PC-BatteryLab™ plots and stores the test results. The Adapter Unit provides a simple interface of over 1,500 Custom Battery Adapters, as well as the user-programmable Smart Cable and RigidArm™. The Cadex C8000 is intuitive to use, requires minimal training, and has many flexible programming options. Chemistry-specific programs provide safe operation for all major battery types. Take advantage of a large selection of standard programs or create your own custom routine to meet your exact testing requirement. Format, condition and restore batteries. Boost — Activates seemingly dead batteries. Automated testing for specialty requirements. Discharge Only — For storage, test applications. Create your own test routines for your specific requirements. * A battery is an electrochemical device and the reactance readings will vary with different test methods. No test instrument is complete without effective software. 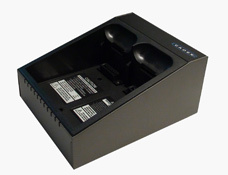 Cadex BatteryLab™ provides a simple, yet powerful interface to control and monitor the C8000. 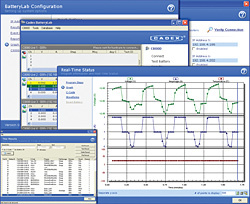 With a PC, control shifts from the analyzer’s front panel to the PC. Programming begins by entering the required battery parameters or choosing a battery from an existing list. BatteryLab™ displays the test results and displays them using real-time graphics. Included as standard interface components. The Power Port Cable is used for power while the Auxiliary Cable is used for data. The RigidArm™ simplifies connecting small (e.g. cellular phone) batteries. Spring-loaded arms meet the battery contacts from the top down and lockable mechanism allows quick and repetitive testing. The retractable floor holds the battery in vertical or horizontal position. Used to combine 2 channels in order to double discharge capability to 20A/160W. 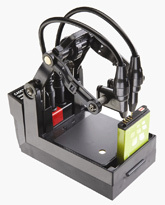 Captures load signatures of up to 100A and digitizes the information for reply in the C8000. Note: The Power Port and Auxiliary Cables are standard.